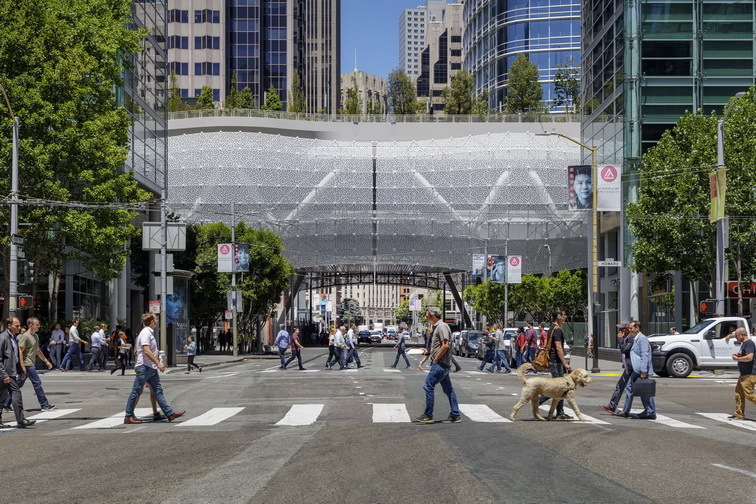 The recently-opened, $2.2-billion Pelli Clarke Pelli Architects–designed Salesforce Transit Center in San Francisco was closed unexpectedly this afternoon after a major crack was discovered in a steel beam that supports the structure’s 5.4-acre roof garden. The fissure is located on the third level bus deck on the eastern side of the transit center. Bus operations that serve the terminal were rerouted back to the so-called “Temporary Terminal,” a makeshift bus depot at Howard and Main Streets that was used while the transit center was under construction over the last eight years. Mohammed Nuru, chairman of the Transbay Joint Powers Authority, the entity that oversaw construction of the transit center, told The San Francisco Chronicle, “I’m told there’s a problem with a steel beam,” without elaborating further. Thornton Tomasetti, the engineer-of-record for the project, did not immediately respond to requests for comments for this story. PWP Landscape Architecture was the landscape architect for the project. It is unclear if the issue at hand is in any way related to recent reports of the pothole-like depressions that have been spotted along the walkway of the rooftop garden in recent days. The nearby Millennium Tower designed by Handel Architects has also suffered mysterious structural anomalies since it opened in 2016. A recent report indicates that the structure was leaning as much as 18 inches to the west. AN will continue to monitor the situation and report updates as news on the transit center takes shape. The streets around the transit center remain closed this morning as crews work to inspect the structure for further anomalies. Reports indicate that the cracked support member was last inspected a year ago and that it is made from American-produced steel. Salesforce Transit Center officials have planned a news conference for noon Pacific time to provide an update on the investigation.